All dresses ordered today will be shipped after 2019-04-29 and arrive after 2019-05-06. Pageant moms know the importance of a fabulous dress when it comes to winning the coveted crown. This gorgeous pageant dress is one example of what to wear to take home the crown at your next pageant. The layers of the fabric goes throughout the whole body, the birthday cake little girl dress has two thin straps to fasten the dress to the body.The skirt is a untraditional A-line shape with a shorter, tier that's embellished with the same pretty fabric as the bodice. The bottom tier of the skirt is ample and full and moves beautifully when your little pageant queen walks. Process time: Items ordered usually takes 8-15 workdays to make. Shipping time: It does not include the time to make the items you ordered. It is up to the shipping method you selected. Normally, it will take 4-6 days for delivery. 1. Can I trust vvdresses.Com as my dresses provider?Why buy from us? 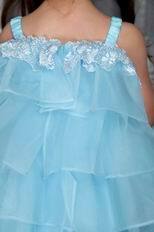 A lot of customers tend to purchase their Prom dresses / prom dresses 6 months earlier than their big day. We recommend our customers purchase their dresses 2-3 months earlier and never buy it at the last minute. With each dress order, we will give a hanging bag for free for the good storage of the dress.